In year four we spent $6,433 more than we made. 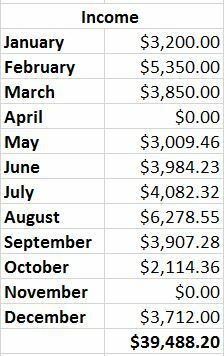 The good news was our costs were relatively low at $45,921 for the year, but we only made $39,488 this year. Interestingly enough, the amount we made would have just covered our budget of $39,217 if we had stuck to our budget. 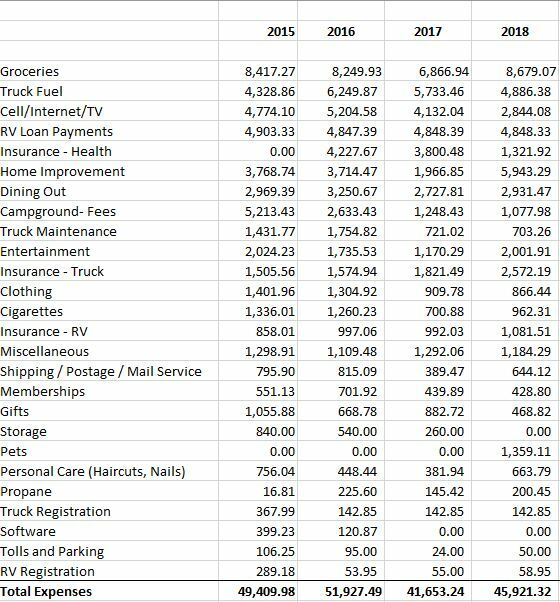 Why did we earn so much less than previous years? Essentially we lost $4500 in revenue when we were unable to find a gate in the month of November, and we didn’t work a higher paying job like Beet harvest or Amazon this year. If we had worked in November we would have been close to breaking even like last year. 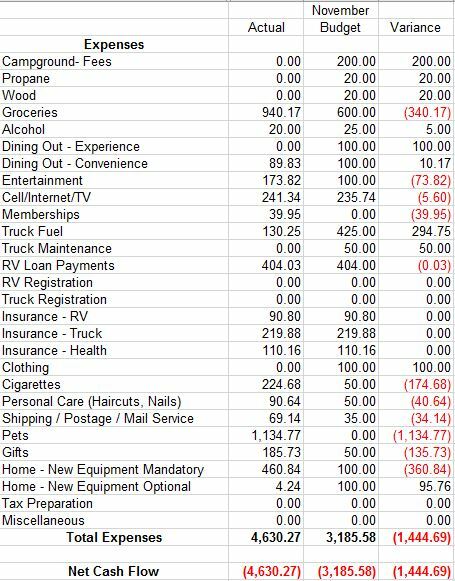 We were $3,500 over budget in RV repairs and upgrades and we overspent $1300 in groceries. Oh and the $1400 we spent on Jack didn’t help either. Side Note: I did want to report that we made $213.71 this year in book royalties, which is deposited to a bank account as actual money, and $360.59 in the Amazon associates program, which is deposited to a gift card account and can only be used at Amazon. I don’t include that money in our budget because we use that to buy little extras throughout the year that we normally couldn’t afford. Since those costs aren’t included I don’t include the revenue. We would like to say thank you very much to everyone who clicked our link or purchase a book. We really appreciate that little bit extra! Since I go through each category every month in detail I am not going to do that here, but I have added an additional chart for the year that shows the Minimum monthly amount, Maximum monthly amount, and monthly average. 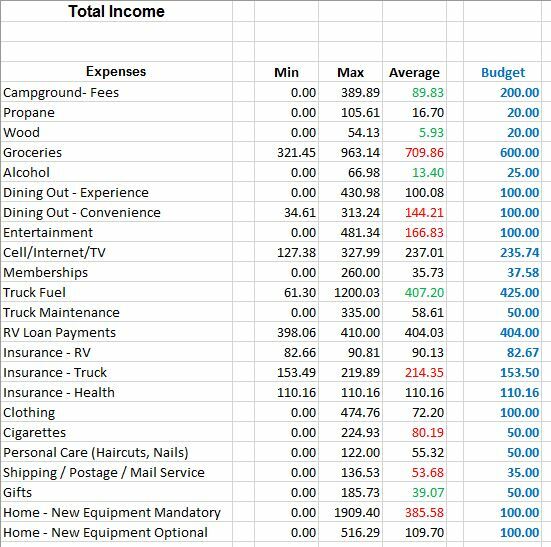 I have compared the monthly average to the budget and anything that’s close I’ve left in black, overages are in red and underages are in green. This is the process I go through to set next years budget targets, and although we don’t always change them, we have made adjustments over the years. The biggest areas of concern are mandatory home improvement and groceries. I am particularly happy with the campground fees and gift catefories, as we have seen significant improvement in those areas. We also did well in truck fuel, which was a direct result of our conscious decision to not travel back east this year. Now that we have four full years of data, we definitely can see some trends developing. You will notice that the categories listed below are a little different, and that is because the budget format has changed over the years. I have grouped the various categories here in a way that makes the most sense and everything else is in miscellaneous. Again, I’m not going to go through every category, but some things did jump out at me. Groceries – Except for last year, the other three year totals are within $400 of each other more or less. We have had a budget of $600 since we went on the road but I think $700 is much more realistic. I know that seems like a lot. It is a lot really for two people, but we eat well, and we are often in remote places where food is just more expensive. Since this amount includes alcohol and we don’t drink much, I think it is inline with what many other people are spending. Even if it isn’t, this doesn’t appear to be an area we are willing to compromise much so we should call it what it is. Truck Fuel – Although as we mentioned we can control this somewhat by deciding how many times we are going to travel back and forth between the east and west, we are also not willing to make major decisions based on this category. Put simply, if we can’t afford the fuel, we need to reevaluate how we are funding the lifestyle. However, we don’t need to be reckless in this category and we do try to combine our trips and be as efficient as possible. Cell/Internet – Not everything goes up every year and we caught a major break with our cell coverage because AT&T finally offered a more reasonably priced unlimited cell plan. Internet is a major part of our life, and I don’t see that changing any time soon, but I will absolutely enjoy the more reasonable pricing. Health Insurance – Our health insurance costs have gone steadily down after the last few years (Year 1 I still had my corporate job and didn’t include costs but it was about $360 a month). We are on the Affordable Care Act and I am not sure why they reduced our costs so much for this year but we will see how it works out once tax time comes. We continue to look for more affordable options and may change this year to something else, but for the last couple of years it has been OK. We both had colonoscopies so definitely got our money’s worth. As of this writing our January premium was paid, and it went up $ 69.26, a 63% increase over last year. Home Expenses– We did so well last year in this category and then wham we got hit with lots of repairs this year. This is a tough one because to some extent it’s a fixed cost, but some of it is variable. This is going to be a major topic of conversation for sure in our annual budget meeting. Dining Out – This category has been super consistent (it spiked a bit the year we went to Alaska) despite our best efforts to keep it lower. I’ll definitely take the heat for this one because I like to go out to eat, and feel it is part of the experience when we hit a new area. 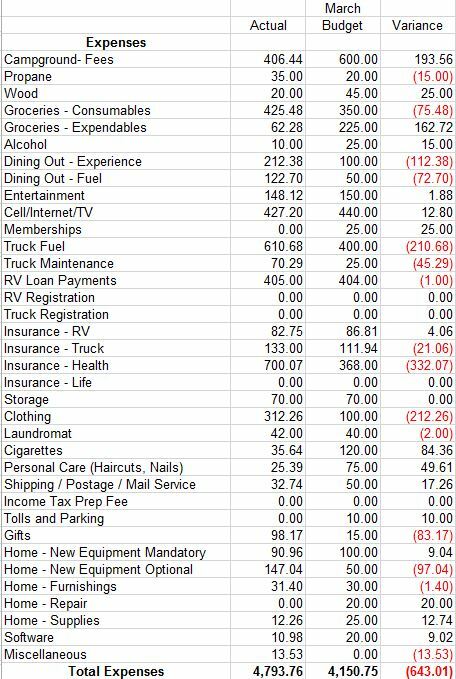 Essentially we are spending $241 a month which is $40 above the $200 we budgeted. This is another one we are going to talk about. 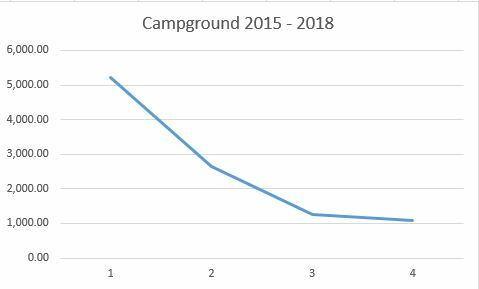 Campground Fees – This is one of my favorite categories because the costs have gone steadily down the last several years. This is due to the fact that our campsites are included in our working and the fact that we can boondock in our our off time. We were also lucky enough to stay 5 weeks for free with some friends which was wonderful. 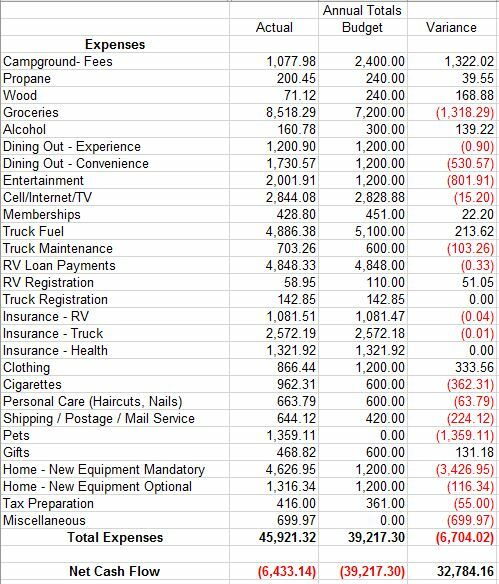 People told me campground fees would go down and they were right This seems to be the case for most people we know. Entertainment – We were doing a nice job of trending down in this category and then spiked back up this year. Mainly that was the trip to Vegas where we spent a ton of money on entertainment and food. I think its clear to both of us that trips like that are not in our future with our current revenue stream, so hopefully that was a one off and it will continue to trend down. Gifts – The last category I wanted to talk about was gifts because I have made a concerted effort in this category and that has definitely trended down significantly. It’s tough because I like to buy things for people, but it’s important to be realistic with what we can afford to do. 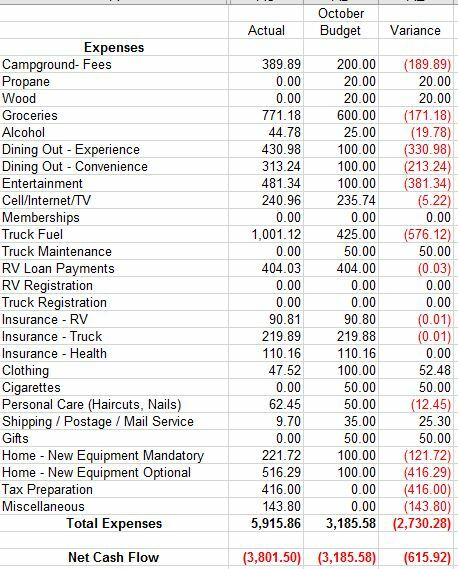 Campground Fees – Most of this was staying at Circus Circus on the strip in Vegas (that place is not cheap) and the rest was the stays when we traveled from Vegas to Texas. Thankfully we have a free place to stay in Texas or this would look even worse. Groceries – This included a $300+ dollar Costco run and lots of smaller grocery runs. We are stuffed to the gills on items now, so hopefully we can eat our way through that while gate guarding and have some low months there. Alcohol – This category includes several drinks in restaurants that we paid for, which is really unusual for us. Since Lee got most of his drinks for free while gambling wasn’t too bad at $20 over budget. Dining Out – OK this was just insane by anyone’s standards, at $544 over budget. We had a $140 dinner for my sister’s birthday, the Paris buffet, a couple of dinners with our friends, and tons of grabbing food while we were traveling or running around. Entertainment – The bulk of this $384 overage was the $200+ tickets to Beatles Love, but Lee and I also went to see Piff the Magic Dragon and went to the rodeo along with other incidental purchases. Truck Fuel – It cost over $1K in fuel to travel from Oregon to Texas. This category is all about the annual total though, and we know when we are relocating we will take a cash flow hit. Home Equipment – We went $538 over in these categories and the bulk of that was the $300+ dollars for the new entry door window, which also fell in October…although we didn’t receive the part until November. Lee also bought a new outside chair since his fell apart and I took advantage of a clearance and bought a new outdoor rug. The rest is numerous pieces parts Lee purchased to work on his rotating list of home projects. It’s been awhile since he has worked on the list, and these are things mostly had to be done. At some point he is going to do another post on that and talk about those projects in more detail. Tax Preparation – Our taxes were a little more complicated this year and we had to file Kentucky and Oregon state taxes. We did get a couple of small refunds, which helped with the costs some but I went ahead and put the full amount of the tax prep here. Still love Travel Tax, who does our taxes. The cost is more than worth my piece of mind. Miscellaneous – I really love Lyft and Uber, but as cheap as the individual charges are it does add up when you are running around. We spent about $100 on rides while we were in Vegas, but it was convenient. Plus it’s nice when you are sharing a car or if you want to drink when you are out. Adds up though. This month looks worse than it truly was from a budget perspective because of two major purchases. We finally broke down and bought good hiking shoes (after I sprained my ankle) and those ran about $250. We also had to double pay our insurance in March as we transitioned to a new policy and had to pay $309 upfront to make sure there was no gap in coverage. So if you take those two purchases out of the equation we were only $100 over which was pretty great considering how much activity we crammed into March. See below for the details. Campground Fees – We did great in this category because we stayed in less expensive campgrounds out west. Look for this to shoot up as we head east and then settle to nothing as we start our work kamping job. Groceries – Really happy with groceries as we ended up about $100 under. We did a great job of managing those costs when we were with Cori and Greg and we focused on cleaning our our freezer (needed defrosting) for the rest of the month. Dining Out – We were over by $180 but $100 of that was our big meal in Texas which was a deliberate splurge. The $72 in eating on the run continues to be a challenge, but not for lack of effort on our part. Travel days we tend to grab food more frequently and it’s simply not practical to pack a lunch everywhere you go. We talk about this a lot though and continue to work on it. We found these great $1 Bumble Bee Snack On The Run at Wal-Mart that Lee really likes and that is helping, but I really need to find an alternative to peanut butter and jelly. Truck Fuel – We were over by $210 which was a bit of a surprise for me since the gas prices are so low. We are filling up the truck every other day on travel days and that does add up. Expect this to get worse before it gets better and I am very curious what happens when we are work kamping in Alaska. Gifts – I splurged and bought gifts from Mexico for my nieces and nephews we will be seeing in April. What is the use of having a traveling Aunt if she doesn’t bring you cool stuff once in a while. Equipment – One of our relatively new Rhino sewer hose s got a leak in it and had to be replaced and Lee installed another 8′ vinyl fence post cover for storing sewer hoses and accessories to get them and their associated odors smells out of the storage compartment. I also bought a ton of magnets and those add up. Anyway, we were about $60 over in aggregate. So not to bad, will see what happens in April.